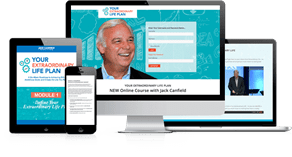 This powerful new program walks you step by step through the entire process of setting and achieving one big, ambitious goal – then shows you how to repeat the process again and again to create the life you want. Get clear on your vision of an Extraordinary Life – so you can identify a goal that will propel you much closer to making that vision a reality. Choose a goal that is aligned with your highest vision – and start clearing your path of obstacles that might be holding you back from achieving more, faster. Create your step-by-step goal achievement plan – and start taking concrete action toward making your goal a reality. Learn powerful mindset techniques that will help you overcome any obstacle and stay motivated as you work through your action steps in pursuit of your big goal. Discover my most powerful productivity techniques for staying focused and on target so you can continue making consistent progress toward your goal. Keep building on what you’ve accomplished, so you can stay inspired and maintain your forward momentum until you’ve achieved your big goal – then repeat your success again and again as you expand your vision of what’s possible and create your Extraordinary Life.